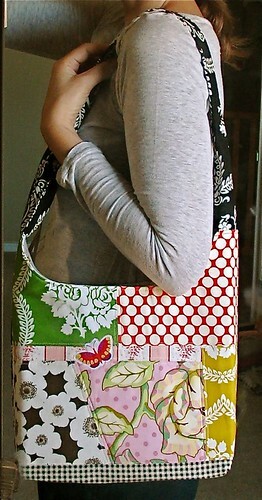 Mama's got a brand new bag - Stop staring and start sewing! I love my old bag but it's really been showing signs of wear (since I take it wherever I go) and finally this last week one of the magnet snaps just ripped right out. So I've been working on a new bag for a few days now and I'm really glad I took my time because Joey kept giving me super ideas to make this a really great bag. For the shape (curved at the top instead of straight across) I was inspired by some bags I saw on ebay and I was tempted to bid on those because they were so pretty, but I really needed a pocket situation that was practical for me. Here is the finished look. I used some of my favorite fabrics and then added some butterflies as an afterthought (but before the final assembly) and I think they really add a touch of whimsy. I used some heavyweight decorator fabric for the bottom (the same print I used on my ironing board cover) to give it more stability and stain resistance where it's really needed. 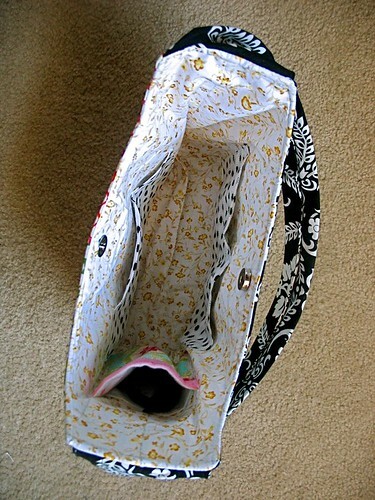 But what I really really love about this bag is the inside. I don't need tons of pockets, just the right kinds of pockets. 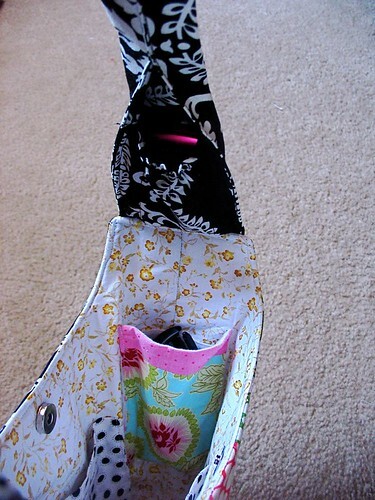 So I made a couple of pockets for things like pens and pads (both the paper kind and the "feminine" kind). But my favorite pockets are the ones Joey recommended. First is the one for my sunglasses. 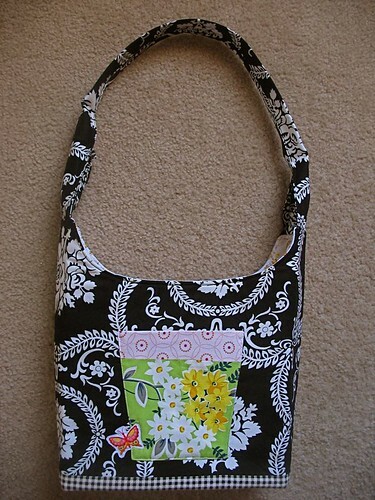 It's lined with flannel (pink polka dots but you really can't see it) and I used one of my precious scraps from Amy Butler'sTemple Flower line just because it makes me happy. I placed it at the end of the bag so I can just reach in and grab it without digging around and this way they won't get crunched in with my other stuff. If you look at the where the strap is attached to the bag you can see my secret "Joey pocket" (this pocket was his idea when he saw the little space there on a previous bag and I thought since a kangaroo has a baby joey and it sleeps in a pocket...well you know). So I keep my cell phone there and this way I'm not digging frantically for it. I added a little elastic to snug it up a bit. I love it! Here's the backside of the bag. I wanted a pocket there but I didn't want it to be out in the open so this way if I put something in there it will be on the side facing me. Another cute butterfly! I'm so happy with the way it turned out! 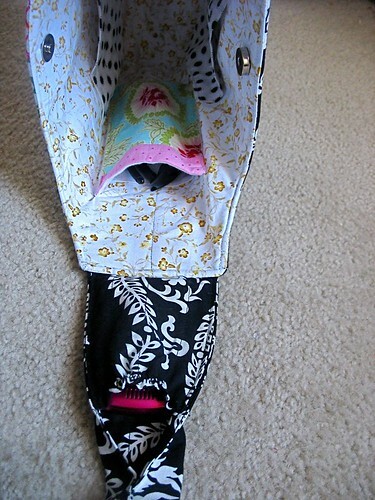 It's both pretty and practical and allowed me the opportunity to use lots of my favorite fabrics in one item. Snazzy! This was a really cheap (and actually quite relaxing) way to spice up my sad wardrobe. Eventually I would like to post a pattern and tutorial for this but in the meantime I highly recommend getting a simple pattern and some great fabric (it doesn't take much) and play around with it. Fun!